Total Area: 1440 Sq. Ft. 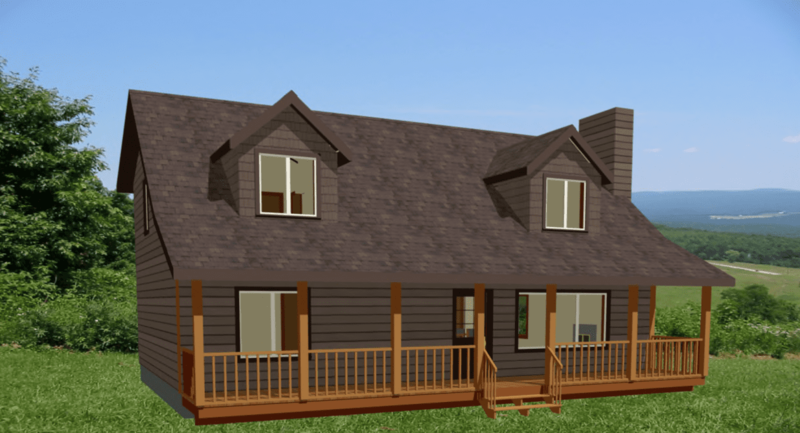 This three bedroom, two bathroom 1,440 square foot timber frame design is rustic and simple. It has great curb appeal with a covered deck and 2 dormers, and could be well suited to life in the country or as a cottage. This is the smaller brother of the Summit and is one of the most efficient and cost effective timber frame designs that we have right now. It still maintains all the features you want in a timber frame, but because of the efficient layout and simple footprint, the cost savings is considerable. As soon as you walk in, you’ll notice the 22 foot vaulted ceilings, and the natural light from the large windows highlighting the wood beams. 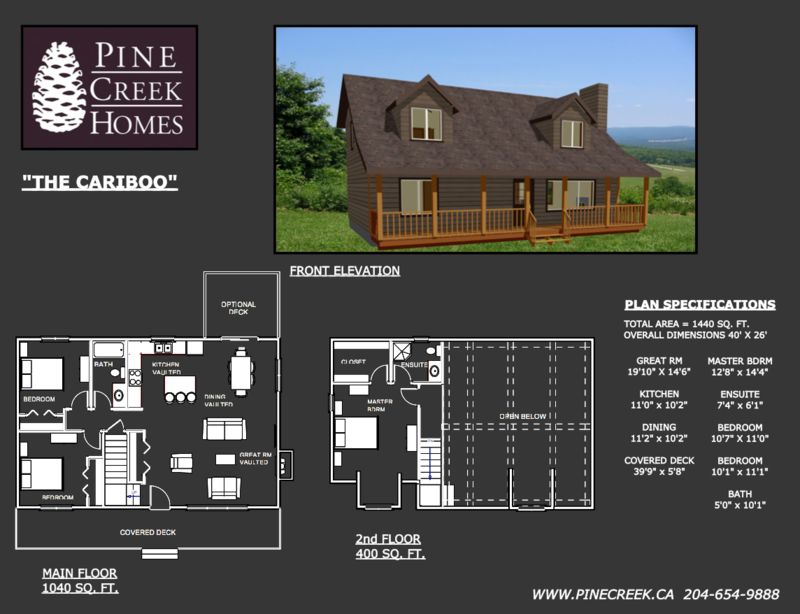 This open concept, with the high vaulted ceilings, is a trademark of the classic timber frame design. The great room has a built-in fireplace and plenty of space on the same wall to create a custom entertainment unit. While sitting in the living area, you’ll still be able to take in the views from outside through the large windows. Moving into the kitchen, you’ll notice plenty of counter space for prepping food, as well as additional space on the island for meal prep, serving food, or entertaining. The dining area on this plan lets in plenty of natural light and really allows you to appreciate the outdoor views around you, with a large window on one wall and a patio door on the other. The master suite is on it’s own, on the second floor, with an ensuite and large walk-in closet. The dormer in the master bedroom is a nice feature that adds texture to the room, as well as plenty of natural light. The 2nd and 3rd bedrooms are together on the main floor, right next to the main floor bath and both have large windows for natural light and allow you to take in the views. Keep in mind, that this layout could be reversed so that the master bedroom is on the main floor and the two other bedrooms are upstairs. Lastly, and one of the most important things to note about this and all of our other plans, is that these designs are simply meant to provide give you with ideas for a starting point. Every home we build has its own custom plan, and we never build the exact same house twice. So, if you see something close to what you like, we can use that as a starting point, or if you don’t see anything you like, feel free to sit down with us and we can draw you your own custom plan from scratch. We look forward to hearing from you!